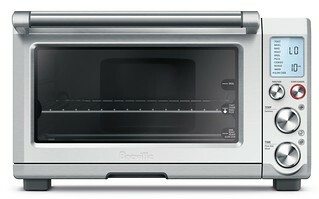 The Breville® Smart Oven® Plus– Toasts evenly, makes delicious cookies, bakes perfect pizza, and roasts succulent meat. The convection option speeds your cooking time by as much as 30%. 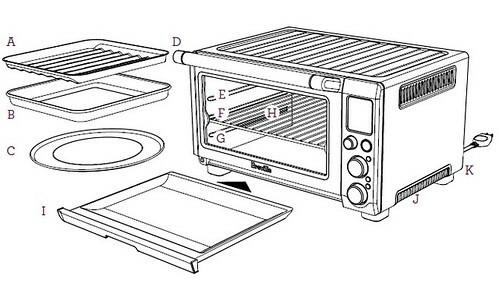 And now, with our Slow Cooking feature, your Smart Oven® is just about all you need for any recipe you have. E. Top Rack Height Position: BROIL Function. F. Middle Rack Height Position: TOAST, BAGEL, PIZZA, and COOKIES Functions. G. Bottom rack Height Position: BAKE, ROAST, REHEAT, WARM, and SLOW COOK Functions. H. Wire Rack. I. Crumb Tray. J. Ventilation Slots. K. Breville Assist® Plug. L. LCD Screen. M. START/CANCEL Button. 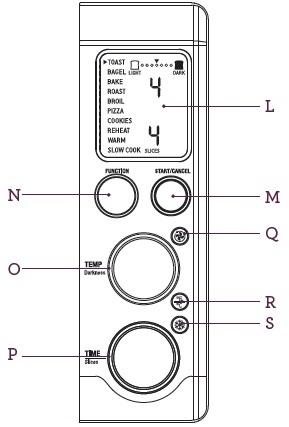 N. FUNCTION Dial. O. TEMPERATURE Dial/Toast Bagel Darkness Control Dial. P. Time Dial/Toast and Bagel Slice Selection/Pizza Size Selection Dial. Q. Convection Button. R. TEMPERATURE CONVERSION Button.